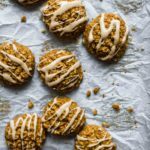 Have you ever had a recipe that sounded perfect and easy in theory, but in practice was extraordinarily frustrating to pull off? Maybe not – and if not, my hat is off to you. This happens to me more often than I’d like, especially as I attempt to veer from standard recipes and forge my own way. 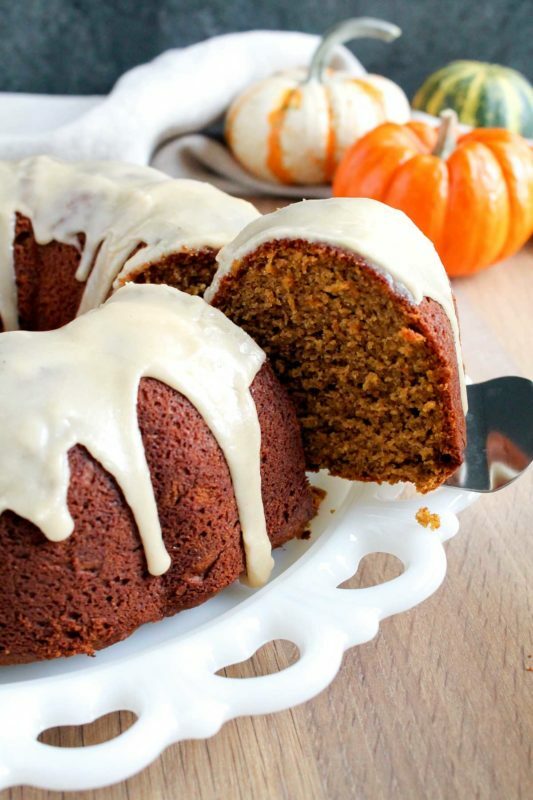 In theory, doesn’t a spiced pumpkin bundt cake sound simple? What could you really need…pumpkin, flour, butter, eggs, cinnamon…? Doesn’t sound so bad. 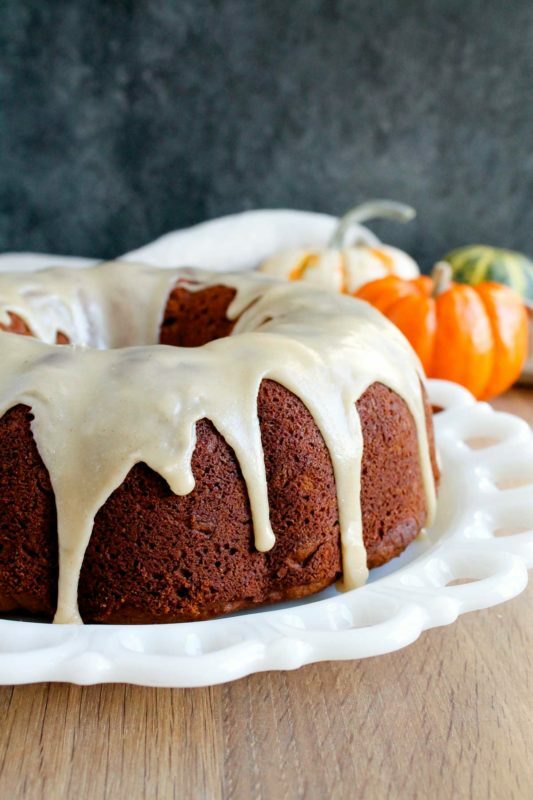 I have fond memories of a pumpkin bundt cake my mom used to make with a can of pumpkin, cake mix, and butterscotch pudding mix, and it always came out positively radiant with fall smells and flavors. Please tell me someone else remembers this cake or had their mom make it for them. It was SO good! She served it simply with whipped cream on top, and it was the greatest. So a few Sundays ago when I set out to make a version that didn’t contain pre-mixed and boxed things, well, I didn’t expect it would be too difficult. I knew I wanted to use an entire can of pumpkin, because it really annoys me when half a can languishes in the fridge. 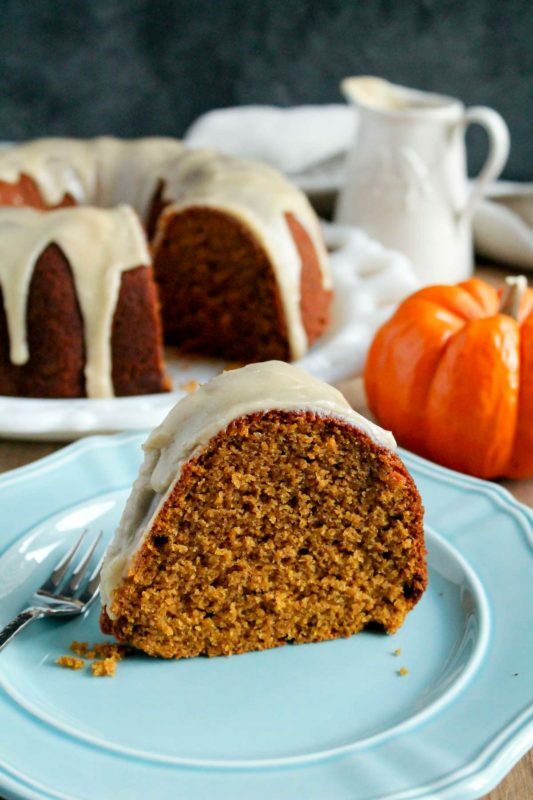 The pumpkin flavor could be brought out with a combination of spices (a la Starbucks pumpkin loaf, which I am not ashamed to admit I adore), and a simple glaze would complement the sweet and spiced squash. I looked at a few different recipes, cobbled some ideas together, and set to work. Whisked, creamed, mixed, and folded, and the batter went in the oven. Fairly soon, Thanksgiving-esque spiced pumpkin smells began to fill our apartment, and I gloated to myself of my genius. What could make this better? I said to myself. Brown butter maple glaze, that’s what. Cream cheese is so overdone. So I whisked that together while the cake cooled, which was all the more epic since Brian was blaring the Lord of the Rings – Return of the King soundtrack in the background [I never said we were normal]. The cake released perfectly from the pan, I poured the glaze over it, took a few pictures, and excitedly cut us two generous slices. You can imagine what’s coming: it was just not great. I used far too many spices which made the flavor flat and muddled; the edges of the cake were dry; and the glaze, while certainly the best part and a star in its own right, overtook the other flavors. Brian didn’t mind and happily ate his piece, but agreed it could use work. Disappointed, the next day I brought my sad pumpkin bundt cake to the one place where I knew no one would care about its shortcomings: the communal office kitchen. I was correct – it was gone quickly. The only person who noticed the same problems I did was my coworker Sarah, who has a similarly discerning palate and penchant for recipe experimentation. She made the wise suggestion that the cake needed “tang” to balance the sweet pumpkin flavor. This, I realized, is why cream cheese is always the default partner to pumpkin: the tang. It offsets the heavy, complex spices with its brightness. You need the contrast for the flavors to feel right. So, the next weekend, I tried again. I used about half the spices I had before, and added yogurt to the cake for moisture and tang factor. I wasn’t ready to let the brown butter maple glaze go, so I made it again in hopes that it would complement the improved cake better. And really, it was fabulous – which is why I’m providing the recipe for it here as an option, because this glaze is really worth making. The cake came out redolent with pumpkin this time, and tasted of it too. And the glaze was perfect. Brian gobbled his piece (and one or two more), and while I loved mine too, I still wasn’t quite satisfied. 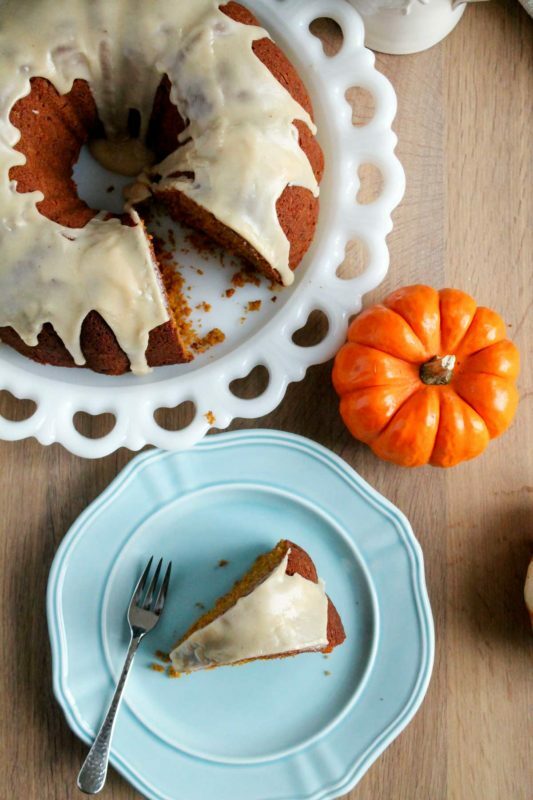 The brown butter flavor is powerful, and at times I still felt it overwhelmed the pumpkin. Again, the results went to the office, and this time I received multiple rave reviews. So – if brown butter is your love language, please do make that glaze for this cake. I don’t think you will receive any complaints, and I’m pretty sure I’m just extremely picky. 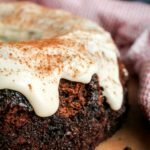 The THIRD time I made this pumpkin bundt cake was last weekend, and this time I went all in on the tang factor with a maple yogurt glaze. You’ll have to be the judge, but I think I finally nailed it with this one. The yogurt glaze is not quite as glossy as the brown butter one, but it delivers on flavor. 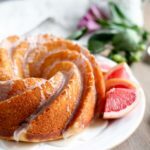 It’s even better when you poke some holes in the cake with a toothpick before pouring the glaze over, so it sinks into the cake and mixes the flavors. It gets better as it sits! I’m sad (very sad) to say that this third attempt didn’t make it to the judges at the office. Whichever glaze you choose, would this be out of place on your Thanksgiving table? I think not. Everyone needs a break from pie now and again. Plus, multiple glaze options is like an adult choose your own adventure. Try it yourself, and tell me which one you prefer! 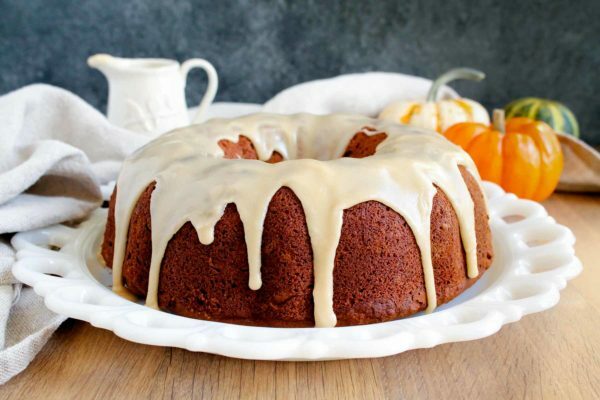 Spiced pumpkin bundt cake is fall in a cake: fragrant, familiar, and comforting. With two options for the glaze! 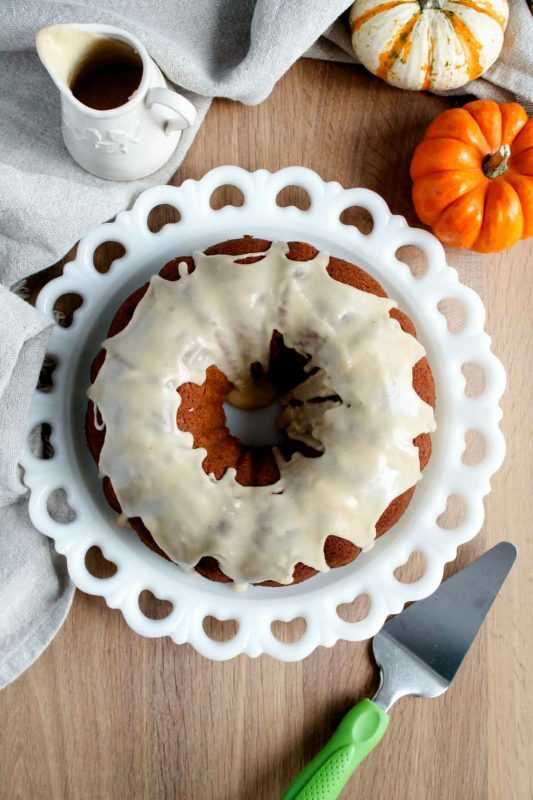 Preheat your oven to 350 degrees F. Generously grease a 12-cup bundt pan and set aside. In a large bowl, whisk together flour, baking powder, baking soda, salt, cinnamon, nutmeg, ginger, and cloves. Set aside. In another large bowl, with a stand mixer with the paddle attachment or hand mixer, cream the butter, olive oil, and brown sugar together beginning on medium speed, then increasing to medium-high speed for about 3 minutes, until the mixture is pale and fluffy. Add the eggs one at a time, beating on medium speed each time until combined. Beat in the pumpkin puree and yogurt on low speed until fully combined. Fold in the flour mixture with a spatula until fully combined. You can also mix on low speed with the mixer, but be careful not to over-mix or the cake won't be as tender. Just get to the point where it's all combined and smooth. Pour batter into the prepared bundt pan, smooth it out evenly, and tap pan on the on counter a few times to eliminate air bubbles. Bake the cake until a toothpick comes out with just a few moist crumbs attached, about 50 minutes. Cool cake COMPLETELY in pan on a rack. Run a butter knife or spatula along the outer and inner edges of the cake, and turn out onto a plate. Top with powdered sugar or the glaze of your choice! In a small saucepan, melt butter over medium heat. Watch carefully, whisking it occasionally, until brown flecks begin appearing on the bottom of the pan and the butter starts to smell nutty. Immediately remove from heat and transfer to a medium bowl. Whisk in maple syrup, powdered sugar, and salt until a smooth and pourable glaze is formed. If it seems too thick, add a little extra maple syrup. Pour over the cooled cake. Poke the cooled cake all over with a toothpick. In a medium bowl, whisk together yogurt, maple syrup, powdered sugar, and salt. This glaze will be a bit runnier than the brown butter glaze. Pour over the cooled cake, making sure to get it in all the holes so it sinks into the cake. Pictures are of the cake with brown butter glaze 0ption. 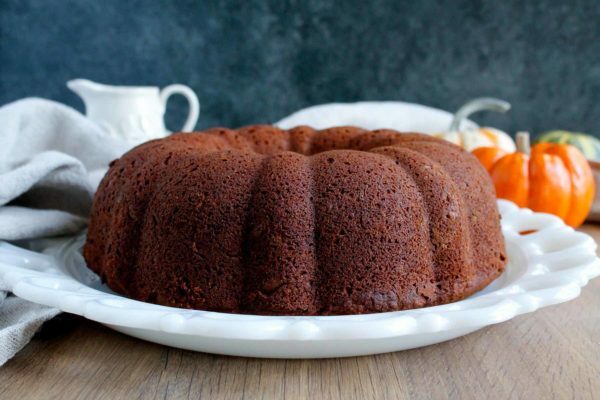 Tender, yummy Bundt Cake with a nice mix of pumpkin and spices. 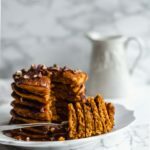 Great on my Thanksgiving table and perfect for breakfast the next day. I didn’t use the brown butter, just the powdered sugar and maple syrup for the glaze. I’d definitely do the brown butter next time if I wasn’t rushing to get everything on the table. So glad you enjoyed it, Jen! Thanks for the great review! This looks yummy! Looking for reviews on it before I tackle it. Can’t find any reviews on your web site! Can I substitute half of the sugar with honey or maple syrup? Hi Esther – I haven’t personally tried it, but I think honey would be an interesting substitute for some of the sugar. I would follow the recommendations of this article by The Kitchn if you’re going to try it. Let me know if it works!